If there is one sure fire way to engage toddlers with a book, it is to choose a story that rhymes. Add some farm animals up to mischief and you have a charming book that is likely to turn story-time into sing-along time. Cows in the Kitchen by June Crebbin is about a group of farm animals that take advantage of the time that Farmer Tom is snoozing. While he is dozing by the haystack there are cows cavorting in the kitchen, hens on the hatstand, sheep lounging on the sofa and more. In fact, all the farm animals make themselves right at home. Farmer Tom wakes to mayhem and shoos the animals out into the yard but it isn’t long before he gets comfortable in his armchair and nods off again – and the animals creep back into the house for some more fun. Cows in the Kitchen can be ‘read’ to the tune of Skip to My Lou and kids will enjoy the added pace. The bright, full page illustrations convey jolly chaos and children will appreciate the mischievous details such as cows balancing plates and ducks pinching sugar cubes. There are many rhyming books for toddlers, simply because the formula works so well – simple rhymes encourage participation and before long you will likely be relegated to just turning the pages whilst your kids do the ‘reading’. This is the kind of book that is on ‘instant replay’ – it’s good fun and likely to be requested over and over. 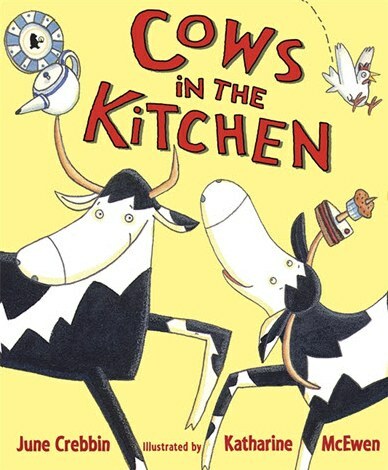 Cows in the Kitchen is available from Fishpond for $9.95.